August is almost over, and with it, we're leaving behind slower days and summer vacations to enter the busiest time of year. For tech, it can feel a bit like going back to school and getting back into the swing of things. So, what better time for a reminder about how important it is to take care of ourselves so we can avoid burnout, think more deeply, connect better with others, and boost our productivity? The term "self-care" gets thrown around a lot these days, and is often used to describe getting enough sleep and exercise, eating clean, maybe throwing in some meditation for good measure. And yes, all of those things are good and helpful for keeping your mind and body on track. But we want to offer a more expansive definition. Self-care is about harnessing your energy for productive good. And if that's the case, then practicing self-care requires a lot more than physical maintenance, and is truly about staying engaged with, curious about, and compelled by what you're doing every day. One thing we've noticed while watching hundreds of entrepreneurs and startup professionals build companies every day, is that too many people compromise or abandon their healthy habits in order to work harder or longer and get more done. But, more often than not, those same healthy habits are what give the most successful people among us the leverage, endurance and brainpower to get more done better in a shorter amount of time — making self-care a distinct competitive advantage. What follows are the key pieces of advice related to self-care that we've published over the years. We hope they'll come in handy for you this fall as you take on new and bigger challenges. 1. This one, simple 15-minute exercise can change everything. Executive Coach Chris Holmberg can’t emphasize the power of consistent practice enough. “People who perform, or play sports, or music, they all see the value of practice.” But in business, almost everyone wants to be good right away. They don’t want to spend time going over what already happened. Mental rehearsal can seem pretty cerebral, but Holmberg’s method is actually quite concrete. And his prescription is shockingly low-lift: Spend 15 minutes a day in reflection — true reflection, in a quiet space, with your inbox closed. Take this time to review the events of the previous day and make plans for the one coming up. You can write these observations down if you want. You can reference your calendar to reflect on the day’s interactions and prepare for tomorrow’s. Whatever will ground you in the ritual. At the end of every week, Holmberg asks his clients to run the same exercise for an hour, only this time reflecting on the past week as a whole and considering the the challenges and opportunities of the week ahead. To a busy founder, taking a whole hour might seem like a waste. But that’s exactly the type of leader who can’t afford to not take the time, he says. Startup leaders can’t afford to have low learning efficiency. They must milk each experience for maximum learning. Reflection is the key for accelerating your learning curve. The It: Did you execute your work — the emails you wanted to write, the strategy document you owed your boss — the stuff you had on your list at the start of the day? Did you do the things that were important and not just urgent? The We: Did you add value to the lives of the people you interacted with? Did they walk away with more knowledge, energy, goodwill, help, a better understanding? “It’s not asking whether you made people happy,” says Holmberg. “That’s not always the goal.” You want to make sure you communicated clearly in a way that added value for them and met goals for you. The I: How did you manage your own energy and mood? Self-care measures like working out, eating well, and sleeping enough are just as important as anything you do in the office. Ironically, those are the things most startup leaders drop first and yet the “I” is the foundation of leadership. You can’t help others if you deplete yourself. The It: Establish the tasks you intend to accomplish during the day and realistically acknowledge the ones that you won’t be able to finish. Do you have meetings during the day? If so, do you know what they’re each for? Do you know what you’re trying to accomplish during them? Do you have your agenda for reaching those goals? The We: Do you anticipate having challenging interactions? For example, do you have any meetings with a colleague who you know is frustrated with you or the company? Think about how you want to show up to that conversation. Consider what he or she might say that will trigger you to react badly. Mentally rehearse how you’d like to respond instead. Write it down, internalize it. Make that your intention. The I: What biases do you bring with you? How can you see through them? How can you set yourself up to make good choices throughout the day (i.e. keeping energy high, your body fueled, etc.)? What might cause you to step off track? What is the right course of action? Identify it ahead of time. Read more about how to get the most out of this exercise and other regular practices from Holmberg here. 2. Harness 'Abundant Thinking' to bring your best attitude and amplify your impact. The ideal attitude is what she calls Abundant Thinking — a mindset that gives you the creative agency and grit to reach your vision — and, on a daily basis, to design your own life. To achieve self-mastery, her clients must move into this mindset more of the time. To help with this, she starts off by giving them a scarcity vs. abundant thinking diagnostic. 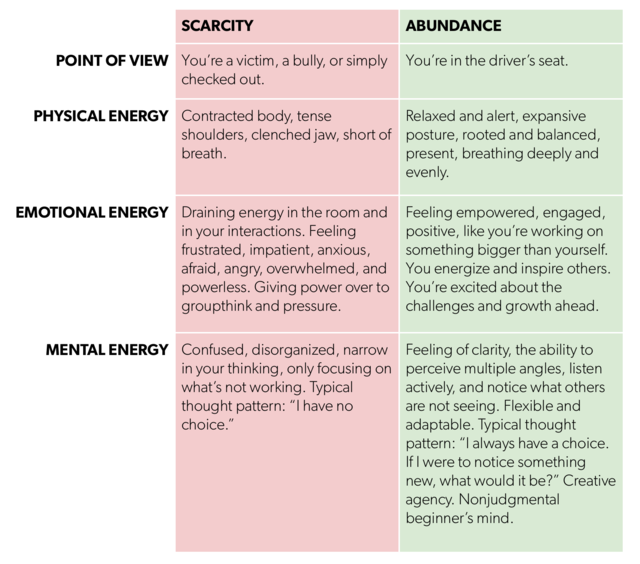 The goal is to separate out and identify the physiology, feelings and thoughts they experience when they're in a scarcity-driven mindset vs. what they experience when they’re thinking abundantly. This helps them truly feel the distinction and notice the tipping point between these two modes in their everyday lives. That way, they can proactively choose a more constructive attitude. Noticing: “Abundance is really your ability to see more in your life: More options, more choices, more resources." Priming: Priming is engaging in a specific activity that boosts your emotional and mental energy immediately. Self-compassion: Resilience is the ability to self-soothe — a process that has three steps or phases. Generosity: Research shows that the most powerful and happy people are at the center of large networks constantly giving to their connections. Gratitude: According to Verresen, looking at your world through a lens of gratitude reveals what might be hidden right in front of you. Of course, this is good news and bad news. The bad news is that no one is constantly wondering if you're okay, how much money you’re making, whether you’re fulfilled in your job or your relationships. Seven more critical life and career lessons from Roizen can be found here. 4. Make happiness your secret weapon — start with making your own safety net. Frederique Dame is one of those effortlessly influential and deeply connected people who make Silicon Valley a better place. Most recently, she was product leader at Uber, and before that at SmugMug, Photobucket and Yahoo!. Today, she's on the board of Ubisoft. In one of the First Round Review's most popular articles of all time, she shared her story and how proactively forging happiness in her life has made all the difference to her career. Finding and maintaining happiness is at the core of self-care. And to do this, she says you need to start with making yourself feel safe. Dame was 24 when she decided to work in the U.S. She was terrified, but hustled to make connections. She remembers printing her resume out at the Stanford library on her way to the Santa Clara University job fair, literally shaking. She ended up getting an offer on this trip. Had she not gone, she wouldn’t have. Dame offers six more principles for creating your own professional happiness here. Frederique Dame in San Francisco. 5. Use one-liners to break the deadlock and gain momentum when you're stuck, tired, reluctant to do the next thing. A blank memo. An empty deck. Everyone knows the hardest thing to do sometimes is just get started. Nowhere is this more true than with an overflowing inbox. That’s why Box VP of Engineering (and biohacking/life hacking expert) Tomas Barreto recommends a practice of depositing one sentence in a response to quickly regain control over the request and its owner. On particularly busy days when his inbox explodes, Barreto will sometimes draft opening lines for twenty emails, versus write twenty lines in an email at a time. To encourage swift action, he'll set a timer for five minutes and work to get through the set. When the alarm sounds, he'll decide whether to continue or move onto another task. A checkpoint at five minutes gives him control via an option to grant more time. Canned responses or email templates are invaluable for repeated requests — especially ones you say “no” to. But this act of a single sentence is not only about answering a request, but the reclamation of a resource — whether that’s your current or future time — in a way where you register the shift of ownership. So, that’s not just shooting off a templated note to get it off your plate — that can result in incessant email ping pong. Instead it’s segmenting the process in such a way that allows you to internally log that transfer of ownership over the ask and tasks. Read on here for more biohacks from Barreto. 6. Flow to your goals with these three do's and one critical don't. In order to be happy, you can’t rely on goal achievement. You have to delight in the work that gets you there, says Scott Crabtree, founder of Happy Brain Science — the organization devoted to surfacing and sharing the scientific underpinnings of what makes people happy and how that makes them more effective at their jobs and in their lives. The most productive people in the world don’t just like what they do on an everyday basis — they enter a flow or high-performance state that brings them consistent satisfaction. Structure your goals: Great goals go beyond SMART (specific, measurable, attainable, relevant to your interests, and time-bound). They have specific milestones that help provide a sense of progress, which is crucial to happiness at work. If you start off with well-defined goals that will allow you to realize success and that have multiple steps toward an endpoint, you are much more likely to enjoy working toward them. Make goals meaningful: “Is pursuing a goal going to bring you internal happiness because you connect with it on a personal level?” Crabtree asks. As a manager, these can be very helpful recommendations for assigning projects. It may take a little extra time, but you can definitely fulfill the first requirement: You can create metrics and deadlines and explain why tasks are important. The second one is a bit harder, but evidence shows that people who understand how their work will directly impact the success of their team or their company feel a stronger connection and are likely to perform better. Align goals with strengths: In this context, 'strengths' doesn’t just refer to people’s talents or skills. A strength is something you are both skilled at and enjoy. “If you have goals that speak to what you’re good at and what feeds you with energy, you’re more likely to be happy,” he says. Managers should keep an eye not only on who is good at what, but what tasks people seem to gravitate toward. Does an engineer want to learn more about product management? Does a writer want to get more involved with design? See if you can find tasks at the intersection of those interests and what they are already good at. So, what keeps most of us out of flow? Multitasking. This is something many people have heard, but it’s become so deeply embedded in our culture of work that we fail to acknowledge it or refuse to believe that it’s having a detrimental effect on our efficiency. A lot of people believe that multitasking makes them even more efficient at what they’re doing. Science shows otherwise, in dramatic fashion. The science is abundantly clear. You cannot pay attention to two things at once and do your best at both. More on attaining and holding onto flow-state performance from Crabtree can be found here. Photo by CSA Plastock/Getty Images.